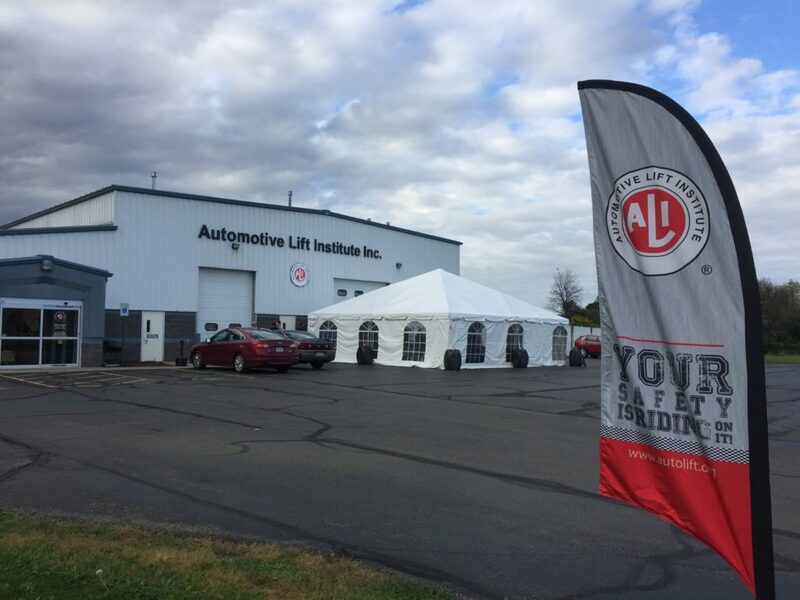 Cortland, New York (Oct. 17, 2017) – The Automotive Lift Institute (ALI) officially opened its new headquarters and LiftLab in Cortland, New York, on Oct. 12, with a grand opening celebration attended by ALI members, lift inspectors, suppliers and other guests from the vehicle lift and workplace safety industries. Growth of ALI lift safety initiatives like the ALI Lift Inspector Certification Program drove the need for a larger multipurpose facility. The new 8,500-square-foot headquarters at 3699 Luker Road is more than four times larger than the organization’s previous Cortland office. It includes 3,475 square feet of renovated office and conference space, as well as a modern classroom that complies with nationally recognized examination requirements for up to 20 participants. What really differentiates the facility is its new LiftLab. ALI member manufacturers have provided and installed 12 vehicle lifts in the expansive LiftLab area. They range from the smallest motorcycle lift to the most common two-post style, all the way up to heavy-duty inground and mobile column lifts. This is the only facility in North America that brings together such a wide range of operational lifts from various manufacturers and makes them available for hands-on industry training. -Light-duty two-post surface-mounted lift, 10,000 lbs. rated capacity. -Light-duty low-rise frame-engaging lift, 10,000 lbs. rated capacity. -Heavy-duty two-post surface-mounted lift, 16,000 lbs. rated capacity. -Set of four wireless heavy-duty wheel-engaging mobile units (mobile column lifts), 54,000 lbs. total rated capacity. -Heavy-duty inground lift, 60,000 lbs. rated capacity. -Heavy-duty scissors lift, 30,000 lbs. rated capacity, equipped with wheels-free device. -Heavy-duty two-post surface-mounted lift, 15,000 lbs. rated capacity. -Light-duty scissors lift, 9,000 lbs. rated capacity. -Heavy-duty four-post surface-mounted lift, 14,000 lbs. rated capacity, equipped with wheels-free device. -Light-duty motorcycle lift, 1,000 lbs. rated capacity. -Light-duty inground lift, 10,000 lbs. rated capacity. -Set of four wireless heavy-duty wheel-engaging mobile units (mobile column lifts), 74,000 lbs. total rated capacity, along with set of four high-reach supplementary stands. ALI is dedicated to the safe design, construction, installation, service, inspection and operation of vehicle lifts used in automotive and heavy-duty vehicle repair shops throughout North America. It sponsors several national lift safety standards, including the ANSI/ALI ALCTV Standard for Automotive Lifts – Safety Requirements for Construction Testing and Validation, ANSI/ALI ALIS Standard for Automotive Lifts – Safety Requirements for Installation and Service, and ANSI/ALI ALOIM Standard for Automotive Lifts – Safety Requirements for Operation, Inspection and Maintenance. ALI also offers third-party certification programs for vehicle lifts and lift inspectors. It was established by nine lift manufacturers in 1945 and had its office in New York City until relocating to Indialantic, Florida, in 1993. ALI moved its headquarters to Cortland in 2005 and has since grown from two employees to eight as the organization has expanded its safety-focused activities. Membership has also grown. There are now 21 member companies and six non-member firms producing ALI certified gold label lifts. Through its Lift Inspector Certification Program, ALI qualifies, tests and certifies vehicle lift inspectors. There are 465 ALI Certified Lift Inspectors and a total of 842 individuals from around the world currently participating in some stage of the certification process. In 2014, ALI expanded its membership beyond North American-based lift manufacturers to include an associate class. ALI Associate Class membership is open to companies with at least one ALI Certified Lift Inspector on staff. There are currently 268 associate class members. For more information about ALI, visit www.autolift.org or call (607) 756-7775. You can also connect with ALI on Facebook at www.facebook.com/LiftInstitute, on Twitter at www.twitter.com/LiftInstitute, and on YouTube at www.youtube.com/LiftInstitute. Editor’s Note: Please see attached photos. Additional photos available upon request. ALI Grand Opening.jpg: The Automotive Lift Institute (ALI) officially opened its new headquarters and LiftLab in Cortland, New York, on Oct. 12. The 8,500-square-foot facility is more than four times larger than the organization’s previous Cortland office. In addition to office and conference space, it features a modern classroom and 12 installed light-duty and heavy-duty vehicle lifts for hands-on training. ALI LiftLab.jpg: The new ALI LiftLab features 12 installed and operational vehicle lifts ranging from a small motorcycle lift through the most common two-post style, all the way up to heavy-duty inground and mobile column lifts. 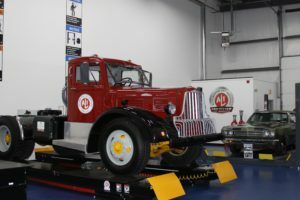 In order to facilitate lift inspector training, some of the lifts are loaded with vehicles, including this 1946 Brockway 260XW truck and 1969 Plymouth Road Runner.